Why is a Water Bottle a Great Marketing Product? Water bottles are a great marketing product, which hold valuable power of quenching a basic human need and ultimately contain the key to survival. 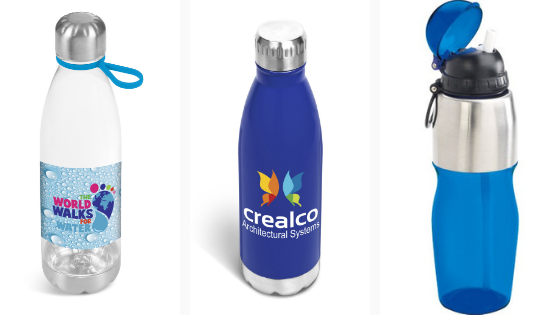 Branded water bottles live a long life in the ecosystem of promotional items and corporate gifts. In the promotional industry, products are aimed to provide useful and trendy items which offer long lasting branding value to your company. 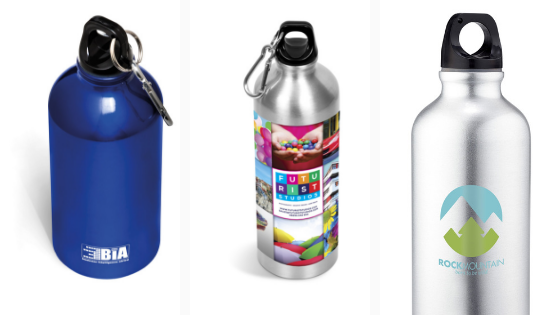 A water bottle branded with your logo will tell the story of your brand for many years to come. Think of the water bottle sitting beside you on your desk, in your bag or all the branded bottles in your cupboards in your home. Wherever you are, your water bottle is. Kind of like a brand being there with you all the time. In the office, at home, in the gym, in your car and pretty much everywhere in your daily life. It is a product that continues branding your logo for you, through every lifestyle, age, gender, race and interest. A promotional product that is possibly the most commonly human item on the market. A promotional item that is used by everyone, anywhere and everywhere. Such a wide reaching and ever-useful promotional merchandise item should not be overlooked, it holds immense power and visibility for your brand. In addition, it often contains one of the most basic human needs for survival, WATER. The value of water is beyond explanation, we are made up of 50-65% water and cannot continue life without it. Water's value extends into growth, production and essentially everything on the earth. Considering the vital importance of water in our lives, a water bottle is necessary for functioning. Aligning your brand to a human need, connects your company to your clients and customers on a very personal level. Creating human connection is one of the biggest and seldom forgotten elements of marketing. For every sip taken from your branded product, you are fulfilling a human need, exposing your brand to new eyes and closing the gap between your company and your customers. Through a water bottle you are telling a story, the story of your brand and its message. In addition, you are adding the value of health to someone's life. 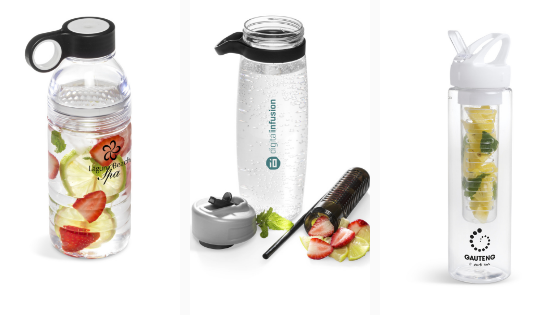 Good health starts simply, with water, and so your branded water bottle provides that, and your brand stands for the importance of keeping well and healthy. The power of a branded item goes beyond what it is and reaches further into what it does and stands for. A drinkware item stands for health, humanity and ultimately fulfilling a basic survival need. A product of worth, meaning and significance across the world. The evolution and advancement of water bottles has introduced a variety of water bottle types. A common factor has been the replacement of plastic based water bottles for BPA free, glass and aluminium materials. The rise of environmentalism has played a vital role for this production change, where the movement away from plastic production decreases pollution and waste to the earth. Bottles made from strong and durable materials like glass and aluminium last longer, can be reused again and again without damage to your health like plastic and with the intention to be broken down and recycled after use, more effectively than plastic. The types of water bottles listed below are all better for the environment and a healthier choice for you. All are available from our online promotional and corporate gifts website, which can be branded with your logo. BPA-free water bottles are made without the harmful chemical called Bisphenol-A, which is an estrogen-imitating chemical. A chemical that has been reported to have negative effects on your health. Products made from BPA are dangerous because the chemical has the potential to leach into the product and contaminate the contents of the plastic item. Bottles made without this chemical, reduce major health concerns like cancer, infertility, diabetes and birth defects. Another appealing factor is that BPA-free water bottles are inexpensive and can now be found almost everywhere as more companies and factories are moving towards BPA-free production of plastic. Glass water bottles are the smarter and better choice for you and the environment. Aluminium water bottles can be made from various types of polyethylene containing either low or high density polyethylene. Bottles made from aluminium have the advantage odor resistance, meaning that the traces of polyethylene will be far less in aluminium bottles than in other types like plastic. Bottles made from aluminium are shock-resistant and deformation-resistant, which means that they can keep the water protected from direct light entering into the water. They are also very lightweight and easy to travel with. Some are environmentally friendly as they can be reused and recycled. Another great fact about these bottles are that they are super durable thanks to their internal coating which is flexible and has a lower chance of cracking or breaking during impact. 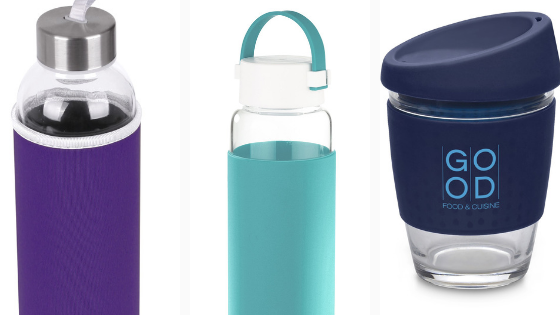 Paired with its secure cap and internal lining, an aluminium water bottle is a keeper! Stainless steel water bottles are typically produced from high-quality stainless steel which enables its excellent durability. These bottles generally do not contain plastic toxins so your health is no worry. Bottles made from stainless steel are most often dishwasher safe which makes them great to reuse over and over. They are the essential travel buddy for any adventure as they are lightweight and do not break or crack easily. Double wall water bottles are great for keeping drinks hot or cold. They are lightweight, durable and are bottles that can be use multiple times over for endless use because of their excellent quality and strength. Most bottles made with a double wall are BPA-free and can be recycled. Many bottles which have infusers are BPA-free which enhances its value. Bottles made with infusers are ideal for adding a splash of taste to a daily essential. 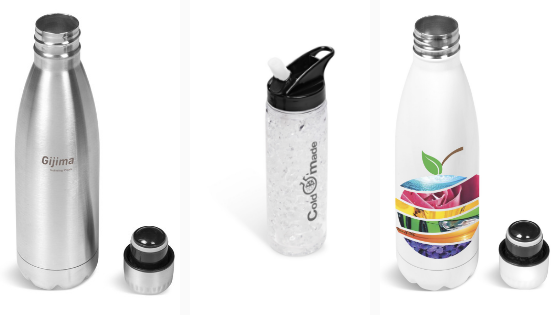 Branding your logo on any of these types of water bottles enhances the experience of your brand and the value your brand has on your customers and clients. Through your consideration of their health and the environment, you are expanding the importance of a water bottle for survival and helping to preserve the planet. To view more great branded water bottles, please visit our website and place your healthier and smarter choice today!